TO REGISTER, GO TO www.gmpartsrebates.com. Select “Service Center or Body Shop Owner” on the home screen and then “Register” or “Login Here” if you were registered for quarter 1 rebates. Submit your rebate online at www.gmpartsrebates.com with a copy(s) of your invoice(s) and circle the qualifying part numbers purchased. Select “Service Center or Body Shop Owner” on the home screen and Log in. Requests must be post marked no later than October 15, 2018. You can track you submissions and view their accumulated earnings on the “Track Submission” page on www.gmpartsrebates.com. If you have not received your prepaid card within 6-8 weeks after the promotion end date, or if you have questions about your submission, call (844) 656-5369 weekdays, 7 am to 11 pm EASTERN time. 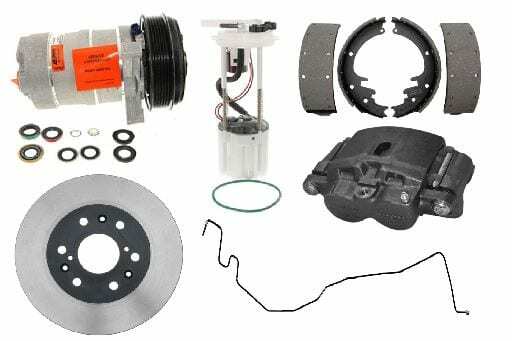 $20 Rebate for Purchase and Installation of a Set of ACDelco Brake Pads! Offer valid 7/1/18 through 8/31/18. 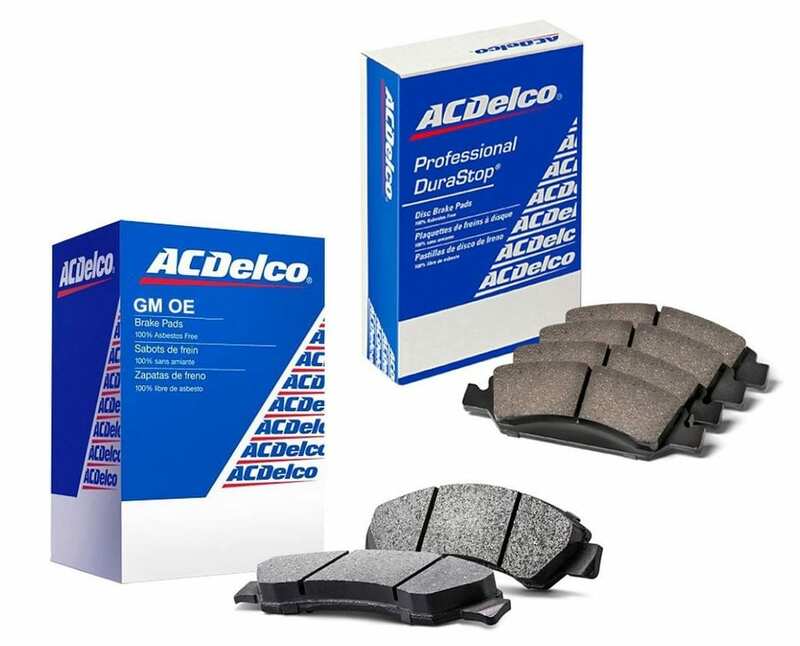 Receive $20 rebate per ACDelco GM OE or Professional Brake Pads at an ACDelco Service Center. Limit of 2 per address. To submit your offer online, go to gmpartsrebates.com and select “Vehicle Owner” on the home screen. Select “Brake Pad Rebate” and follow the prompts. You will need to upload a copy of your dated receipt from a retailer or paid repair order from a professional installer with the part number detail included. If you have not received your rebate debit card within 8 weeks of your qualified submission, or if you have questions about your submission, you may visit gmpartsrebates.com or call 1(844)656-5369 weekdays, 7 a.m. to 11 p.m. EST. 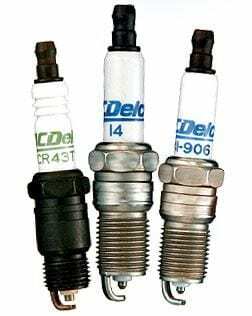 Rebate of $3.00 per ACDelco Professional Iridium Spark Plugs, $2.00 per ACDelco Professional Platinum Spark Plug, $1.00 per ACDelco Rapidfire Performance Single Platinum Spark Plug and 50¢ per ACDelco Professional Conventional Spark Plug! Minimum of 4 and Maximum of 16 Spark Plugs per household not to exceed $48.00. Rebate valid between January 01, 2018 throught December 31, 2018. Rebate must be postmarked by January 31, 2019. Requests must be post marked no later than January 31, 2019. If you have not received your prepaid card within 8 weeks after the postmark date of your qualified submission, or if you have questions about your submission, visit www.GMPartsRebates.com or call (844) 656-5369 weekdays, 7 am to 11 pm EASTERN time. 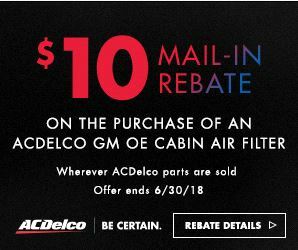 Up to a $10 Rebate per ACDelco Cabin Air Filter You Purchase! Offer valid 5/1/18 through 6/30/18. Receive $10 rebate per ACDelco GM OE Cabin Air Filter, and $5 rebate per ACDelco Professional Cabin Air Filter. Limit of 2 per address. To submit your offer ONLINE, go to gmpartsrebates.com and select “Vehicle Owner”on the home screen. Select “Cabin Air Filter Rebate Offer” and follow the prompts. You will need to upload a copy of your dated receipt from a retailer or paid repair order from a professional installer with the part number detail included. Up to a $1,000 Rebate on Baseline Tire Changer and Wheel Balancer Purchases! Offer valid on purchases of quailfying Baseline® equipment between June 4, 2018 and August 31, 2018. Form must be postmarked by September 14, 2018. Offer not valid for schools, tech schools or government agencies. Rebate checks will be made payable to the company name chown on this request. 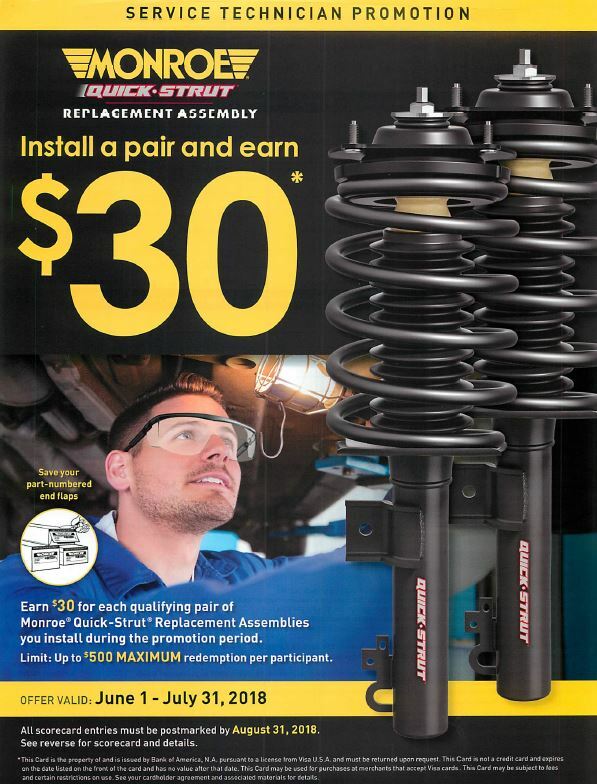 Install a pair of Monroe Quick Struts and earn $30 per pair! Offer vaild on purchases dated June 1 and July 31, 2018. All scorecard entries must be postmarked by August 31, 2018. For every purchase of a pair of qaulifying Monroe Quick Strut product installed, you earn a $30 rebate. There is a $500 maximum rebate per participant. Qualifing products/ series are as follows: Monroe Quick-Strut Replacement Assemblies 139000, 171000, 172000, 239000, 271000, 272000, 273000, 371000, 372000, 471000, 472000, 571000, 572000, 672000, 872000, 972000 series. To participate in any of the Tenneco promotions, you will need to register at www.rewards.tenneco.com. All registered participants will be emailed a username and password. You will need to following supporting documents for EACH INSTALLATION of a pair of qualifying parts: date of installation, product part number, invoice number, original part numbered end flaps (no photo copies) for each pair, and a copy of the customer work order or customer sales invoice. Alternatively, you may mail this form (incomplete forms will not be accepted) along with copies of your customer work orders or customer sales and the original part-numbered end flaps to the address listed above. Please call 1(855) 786-8883 with any program questions. The award will be mailed directly to the address to participant provided. Allow 8-10 weeks for processing. Awards are non-transferable. Purchase 12 boxes of eligible Parts Master Bulk Boxed Oil and get a FREE rack! The 12 boxes must be on ONE INVOICE. Limit of one rack per INSTALLER location. In exchange for receiving a Parts Master Bulk Box™ Racking System, the installer account agrees to purchase twelve (12) additional Parts Master Bulk Box™ packaged product within the first year of receipt of the rack. A toal of twenty-four (24) Parts Master Bulk Box™ packaged product will have been bought in the first year of receiving the rack; 12 on the initial order and 12 within the year. It also assumes that only Parts Master Bulk Box™packaged products shall be displayed on the Parts Master Bulk Box™ Racking System. 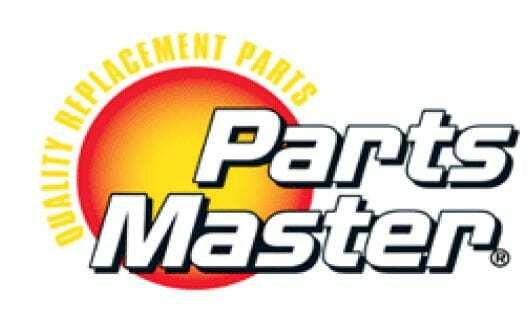 If the installer account stops purchasing Parts Master lubricant products; or at any time the above terms of this Agreement are not met; the designated channel partner, in their sole discretion, has the right to remove the Parts Master Bulk Box™ Racking System from the customer location. Complete this form and include your invoice that shows the 12 Parts Master Bulk boxes purchased (business name, address, product sold and product pricing must be on invoice, NO HANDWRITTEN INVOICES/ RECEIPTS WILL BE ACCEPTED) to: Attn: Janet Thacker P.O. Box 55270 Lexington, KY 40555 You may also fax your form and invoice copy to (866) 310-6311. 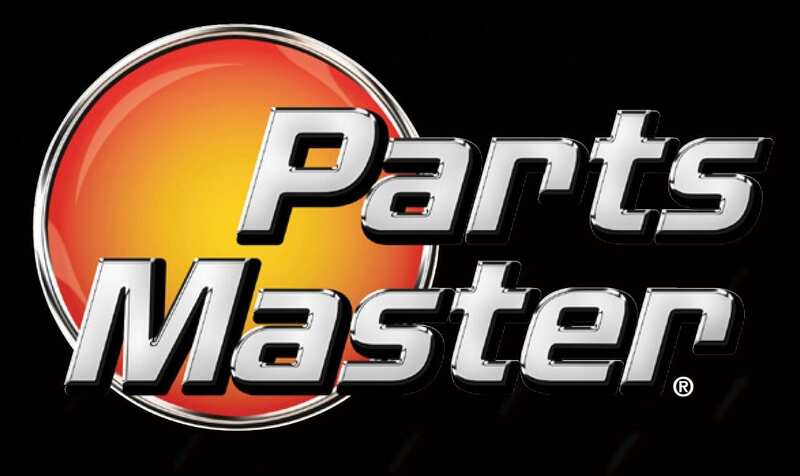 $50 Rebate on Parts Master Lubricants in Drums! Offer valid on purchases dated June 1 to July 31, 2018. Handwritten invoices/receipts are not eligible. All claims must be received by August 31, 2018. Limit of 6 drums per rebate ($300 maximum rebate). Drums only. Checks will be mailed to business address only. Submissions received from sales representatives and sellers will not be acknowledged or returned. To receive your rebate, attach eligible invoice/ receipts to this completed form (Click here for Rebate Form) and email to valvolinepromotions@valvoline.com or fax to 1(866) 330-9629. 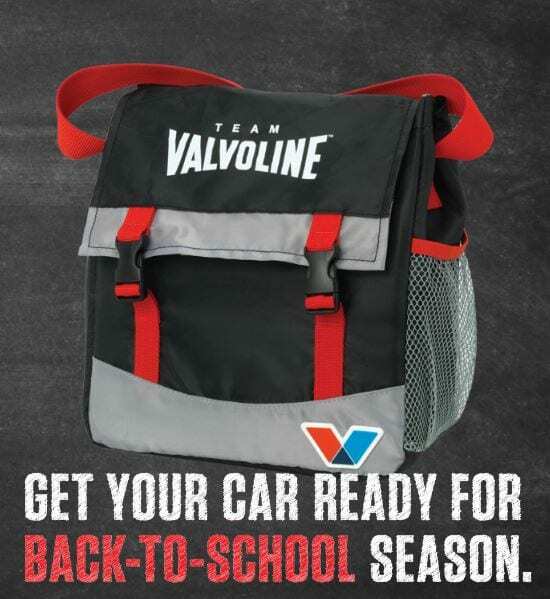 Buy Valvoline Motor Oil or Premium Blue Engine Oil and Get a Free Lunch Cooler! Offer valid on purchases date June 26, 2018 to September 30, 2018. All requests must be received by October 30, 2018. To qualify for this promotion you must purchase one of the following: Five Quarts of Any Valvoline Motor Oil or Two Gallons of Premium Blue Engine Oil. Maximum rebate of one lunch cooler with verified purchase per individual, household or address. Please allow up to eight weeks to receive your lunch cooler. To check the status of your rebate, please go to www.valvolinetracker.com. Install a Walker Direct Fit Catalytic Converter, Walker CalCat Direct-Fit Catalytic Converter, Walker Quiet Flow SS Muffler or Welded Assembly and earn up to $500! 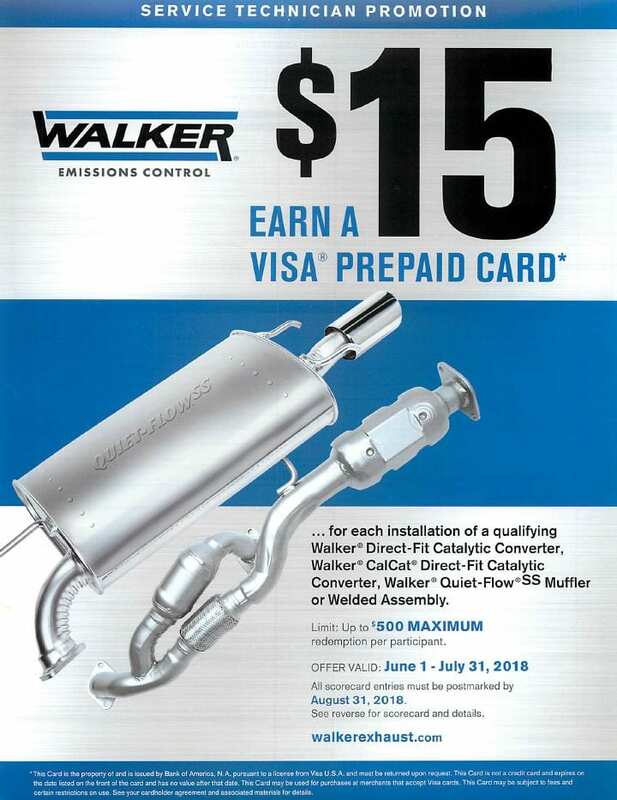 For every nstallation of a qaulifying Walker Direct Fit Catalytic Converter, Walker CalCat Direct-Fit Catalytic Converter, Walker Quiet Flow SS Muffler or Welded Assembly, you earn a $15 rebate. There is a $500 maximum rebate per participant. -Walker Direct Fit Catalytic Converter: 21000-22999 Series, 40032-49999 Series, 50050-59999 Series. You will need to following supporting documents for EACH INSTALLATION of a pair of qualifying parts: date of installation, product part number, invoice number, and a copy of the customer work order or customer sales invoice. Alternatively, you may mail this form (incomplete forms will not be accepted) along with copies of your customer work orders or customer sales to the address listed above.